Welcome to the largest community of drivers making parking easy together! SpotAngels takes the stress out of parking once and for all. The app will help you find free parking, get parking deals and book them, as well as avoid expensive street cleaning tickets! 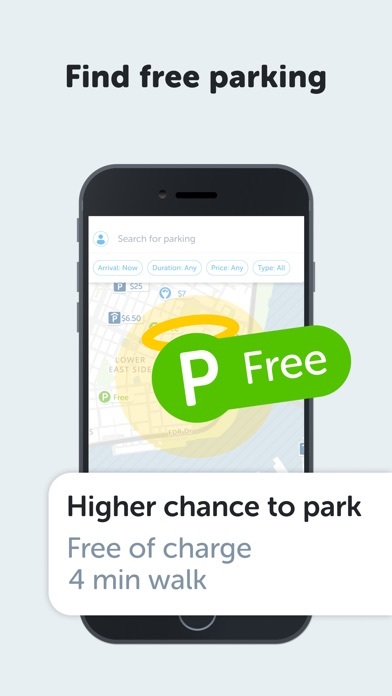 **Find free parking** SpotAngels shows a crowdsourced map of all street parking spots and parking garages, with detailed rules and prices kept up-to-date by our community. It also shows where you're likely to find street parking based on where drivers of the community previously parked. Search and filter the map in 1 tap to find free parking and save money! **Get all the parking deals** SpotAngels shows you all the deals on parking garages so you can save money when you can't park for free. You'll also be able to book parking if you want to through our partner websites. **Get street cleaning and alternate side parking hours for your neighborhood** See where to park to avoid street cleaning or alternate side parking. SpotAngels also supports residential parking permits in cities where they apply. 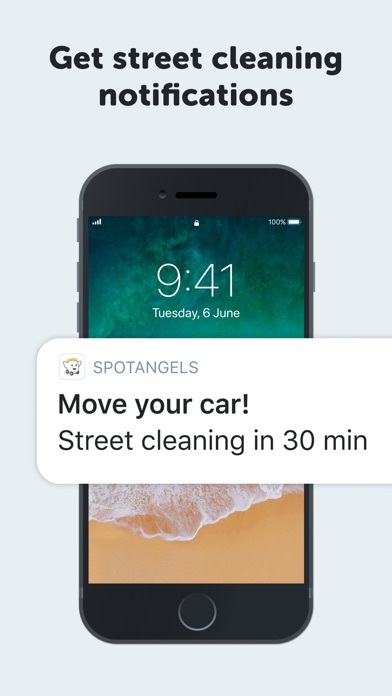 **Locate your car at any time and avoid tickets** SpotAngels automatically remembers your parking location using your car’s Bluetooth or phone sensors. It then sends you notifications when it’s time to move your car for street cleaning or any other street parking rule. **Start crowdsourcing to put your city on the map! 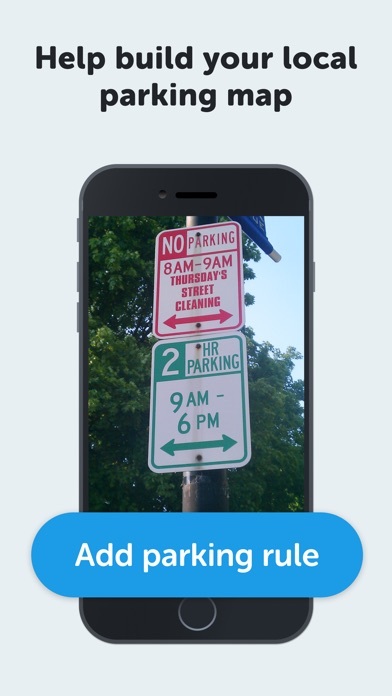 ** Drivers in the SpotAngels community can add or edit parking rules at any time by simply sending a picture of a parking sign. They can also report open spots for other drivers of the community. Atlanta Austin Berkeley Boston Chicago Columbus Dallas Detroit Hoboken Houston Indianapolis Jacksonville Los Angeles (LA) Miami New York City (NYC) Oakland Philadelphia (Philly) Phoenix Portland San Antonio San Diego San Francisco (SF) San Jose Santa Monica Seattle Washington, D.C. Start crowdsourcing to put your city on the map! They are talking about SpotAngels: “The NYC street parking spot finder” New York Post “The solution to NYC parking tickets” Fox 5 New York "SpotAngels can at least make sure you avoid a parking ticket" The Boston Globe "SpotAngels helps drivers avoid parking tickets” San Francisco Chronicle “San Francisco parking app protects you from parking tickets” CBS San Francisco "Useful for finding open meters and free parking" Chicago Tribune "SpotAngels helps drivers find free parking and cheap parking, fast" Patch Los Angeles "The map helps drivers find free and cheap parking" Patch Seattle Happy parking :) We’re here to help at [email protected] if you have any questions. I can’t believe how helpful and easy to use this app is. Decided last minute to drive into NYC for the weekend, and downloaded this app on the way there. I was able to find a spot using the map feature, and safely parked my car on the street all day Saturday and Sunday without fear of a ticket. Just keep in mind that in NYC, you can’t park within 15’ of a fire hydrant (either side). Do you sell a Bluetooth that stays in the car to notify my phone when I’ve parked? It would be better than turning on the location services. Love this app. This app is so great. It tells you open spots for the parking around San Francisco. Used this app to advise me on parking free in the lower east village area on Fri. afternoon. I was going to E. 6th St & it advised trying to find a spot on E. 3rd. I drove in on E. 2nd & found a spot quickly. We walked the short distance up to E6th St. Spot Angels did its job! I downloaded this mainly for a street sweeping reminder. It does not work well because it requires that every time you park, you manually go into the app to confirm your parking location. If you don’t do this, it won’t send parking reminders. How about you just send the person the reminder from BOTH sides of the street instead of none at all. Stupid app design. This app has saved me SO much money and cuts out the endless searching for where to park in super busy neighborhoods/ expensive garages around town. User is able to update parking signs and meter costs if it isn’t accurate. It also automatically saves your parking spot from where you last parked (in case of super busy days running around town, you can be quite forgetful). I was suggested this app from another user and am quite happy. This is an excellent app for a person who parks on the street in a large city. It keeps track of where you left the car and when you need to move it for street cleaning. Some other features are a little half baked but it performs it's primary function well. Recently moved to LA. This app is a life savor. No more reading confusing signs. Notifies you when you need to move your car. Totally worth it! I downloaded this app after seeing some good reviews about it. First impressions were pretty good and I really liked it saving my vehicles location, but really my phone already does. My city isn't supported (the list of supported cities is very small). My phone battery was dying really quickly over the past week so today I opened up my settings to try to figure out why. This app drained my battery by 43% in a single day and I never even opened it. That's absolutely ridiculous! Facebook and Snapchat (both of which are known for battery draining) only took up 8%! As soon as I saw that in my settings I deleted the app instantly. Only download this app if you HAVE to use it in a major city or if you plan to visit one (but be sure to delete it afterwards if you want to keep a healthy battery)! This app works well, but the only complaint I have is not being able to invite others to view your car location. For anyone that shares a car when commuting ( think significant other)it would've very helpful if they could look up the location where the car was last parked. The reason for my two star rating is that the app wants a lot of tracking privileges — this is ok with my as long as I’m getting a service in return — however, in two cities that I frequent (Austin and Houston) the area served by the app is a very very small slice of downtown. Not that useful with current offering of spaces. However, I can definitely see how this app could be great based on the areas that are available. I decided to delete the app because the area served in Houston, the largest city in Texas is very small, especially when considering “downtown is practically everywhere inside the 610 loop. I don’t want to give away my location and motion data continuously when I’ll rarely be in the specific area to use this app. This app is a lifesaver and it works great in NYC and Hoboken, tried it with an iPhone X and then XS and both worked without a glitch. App does exactly what it says. Initially had an issue with sharing a car with my wife, but the dev team responded to my feedback quickly and offered support. When I click google direction to guide me to the parking spot it takes me NO WHERE. I am so happy someone actually built this - and built it well! This has already saved me so much parking pain. Bravo, guys! It notifies me every time I park my car shortly after I park (a minute or two). I was at home and had been home for about 3 hours when it notified me about my parking location. I thought it was weird because I had parked hours ago. I opened the app to where it said my car was parked and had a mini heart attack. It said my car was parked in some random spot miles away from me. I parked my car about half a block away around the corner so I ran to where my car was thinking someone had stolen it. My car was there. Right where I left it. Don’t know why it’s telling me it’s parked miles away from my home but that’s pretty annoying. Before posting this I tried to go to their app support page. It brings you to an ad for the SpotAngels app. Then offers to send you to the mobile site. The only page available is the web version of the app. However it is a great concept. Useless to me. I want to reserve parking in November 2018 for a week. Right now it is September 2018. When you put in dates, it goes back to today’s date. Am I using the app for a purpose it is not built for? If so why are there options to put in the dates you need? 4 stars for concept. 1 star for app usability. Yesterday, Wednesday, I walked outside to my car and to my surprise that was the ticket on the window. On Tuesday evening I park my car, and I forgot to check the alternate side, my mistake. When going back to double check I received a notification saying alternate side is Thursday. So I went back inside, my mistake again. The street I was on was not a small street where both sides are close together, it’s a wide street with 2 way traffic and much room to spare. This is the entire function of this feature on the app, the developer has told me this does not work in New York City or California, which is half or more it’s market. Basically app doesn’t work for what it was built to do. The app does ask for you to confirm your location, which I thought was just to confirm that you are at this area, not to confirm your exact coordinate location. If that’s the case, you don’t need this gps feature , as you have to check anyway. Alternate Side Parking. If you're dealing with it you know. SpotAngel used to be a great way of figuring out where to look for a spot Then it started needing Always for location access. (The app won’t even run until you grant it.) I don’t grant Always access (that’s just that) so now I can’t use the app. It’s really disappointing; the app was really useful. Uninstalling. If you’re thinking about it, get it! The map of parking rules alone is very useful, showing you which streets are permit zones, meter zones, free parking zones, etc. For SF drivers, this app works great! Used app to find free street parking in NYC on Sunday. Very helpful and saved lots of money! Really good app with great data in NYC - is definitely a real help for ASP rules. The Bluetooth detection is unbearably unreliable though. Even when my car is playing music automatically when I turn it on and it picks up my phone, when I turn the car off at least 70% of the time the app doesn’t register me as parked if it is running in the background on my phone. It’s got worse over time, which is frankly weird. It probably the best thing about this app and it frequently doesn’t work. I was having problems with the app and it turns out I didn’t have the cellular data turned on in my settings. Their customer service reached out to me and fixed the problem right away. I’ve never received better service from an app! Being a hospital shift worker you can usually expect to have your car parked for 12-24 hours a day. This can rack up to $81 for one shift! But now, I can find easy parking close to the hospital and get alerts when my time is getting close to move or add more time. Love this app!!! Was given 3 options (Only While Using the App, Always Allow, Don’t Allow) for sharing my location but was unable to proceed setting up the app unless I marked “Always Allow”. Traumatized by a nearly $300 hit to my wallet after being towed in NYC, I decided I needed to get serious. This app is amazing because it not only warns you of potential tickets, but maps all the free areas of parking so you don’t waste time trolling for parking in the wrong areas. I love you spot angel! This app is a charm. So useful! 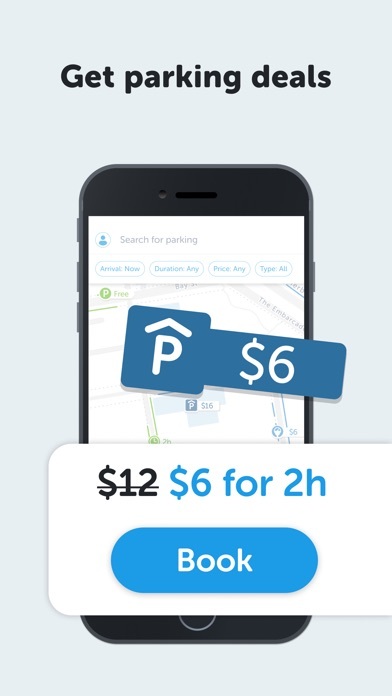 I use this app regularly to find free or cheap parking near where I park. The new version is a huge enhancement. The street parking availability feature is off to a great start and will get better as more folks use the app. I love that the devs update the app regularly with new features and bug fixes. Keep them coming. Best of all, it’s free. Thank you Spot Angels! This old idea that you have launched will never work in a city like Hoboken. When a parking spot opens on a street it is filled within seconds. If you did your homework you would know this. So the thought that you can create a community based app that lets you know where open spots are is ridiculous, its fake news. Not to mention you would have to get 100% of all the residents who park and 100% of all the visitors using the app to make it accurate at all times. The moment a non app user unparks, the app users will never know. Complete waste of time and resources.